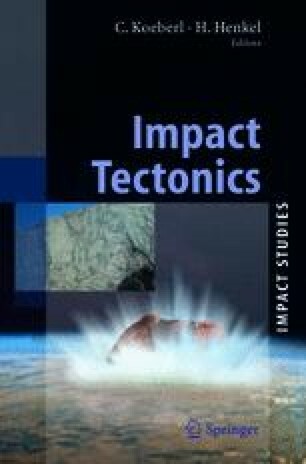 We attempt to determine the poorly constrained age of the ≤13 km diameter Kentland impact crater in Indiana, USA (40°45′N, 87° 24′W) through a three-stage fission-track study of the apatite-bearing St. Peter Sandstone (Ordovician) using: 1) three outcrop samples from the Newton County stone quarry in Kentland, in the center of the crater, 2) three subsurface core samples from neighboring Indiana counties, 31–53 km away, and 3) twenty far-field subsurface and outcrop samples from Illinois and Indiana, 138–302 km away. All of the samples studied have been thermally reset and are significantly younger than the ~460 Ma St. Peter Sandstone depositional age. Modeling fission-track age and track length distributions indicates that the St. Peter Sandstone in the crater was heated to ≥135°C at some unknown time after deposition, and then, 184±13 m.y. ago in the Jurassic, cooled rapidly through 135°C. The Jurassic cooling age is consistent with Mississippian-Pleistocene stratigraphic constraints on the age of the crater, and is significantly older than a Late Cretaceous (< 97±10 Ma) paleomagnetically determined age. We test a working hypothesis that if the reset fission-track ages in the crater are related to impact, uplift, excavation, and exhumation, then additional fission-track ages from more distant samples should decrease to some background age level within a few crater diameter distances away. Three subsurface samples 2 to 4 crater diameter distances away fail the hypothesis test; they yielded a model composite cooling age of 185±11 Ma, statistically identical to that obtained from the crater samples, and also a similar ≦130°C peak burial temperature. Seventeen of the twenty farfield samples, tens of crater diameters (237–251 km) from the crater, yielded apatite grains; ten yielded >5 grains each: eight gave fission-track ages that overlap at 2σ with those from the crater center, and fail the test of our working hypothesis; one gave an apparent outlier age; and only one outcrop sample gave a possible significantly older pooled fission-track age. We conclude that we have not dated the age of the crater, but rather some regional-scale cooling and exhumation event that either predates or postdates impact. This work provides no new constraints on the age of the crater, but illustrates some of the limitations related to using fission tracks to date deeply eroded craters. (U-Th)/He dating of the crater apatite samples, and a more robust paleomagnetic fold test, might help further constrain the crater age.